Dutch entrepreneur Pieter Hoff retired from exporting flowers and turned to invention. 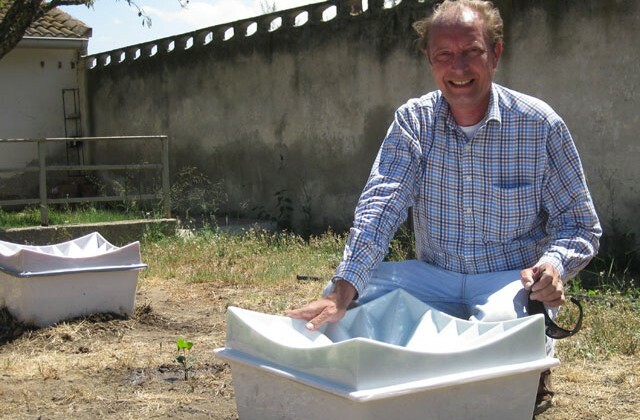 His invention, Groasis Waterboxx is basically a 20-inch by 10-inch polypropylene box that captures water from the air in order to support the growth of new plants and trees. The inspiration for this box is modeled after the way excrement protects seeds that birds have digested, providing humidity and shelter from the elements so they can grow. The box surrounds a young plant and at night an insulation plate allows it to harvest water through condensation. The lid also captures rainwater. A tiny “wick” then deposits small amounts of collected water onto the plant’s roots daily. 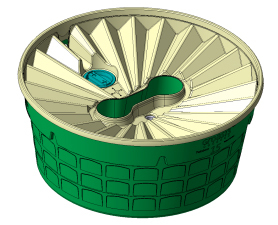 The Groasis delivers enough water so that the plant can access deeper reserves underground, then the box lifts up and can be reused with another plant. Polypro is plastic, but Hoff told Green Inc. that he’s working on a biodegradable model constructed from bioplastic. Recently Hoff wrapped up tests of his prototype in the Sahara, where 90 % of trees planted with the box survived after it was taken away while only 10 % of box-less trees survived. Now, his plan is to test the Groasis in a few dozen other areas. Hope the birds don’t become jealous. Photo: Pieter Hoff with his Groasis Waterboxx and illustration of the box. Credit: AquaPro.